Sarah: Blue Rib. It was a hand written and drawn zine about neighbors I had growing up, musicians I liked beginning with the letter ‘K’, films I had seen with boys I knew and how to make nachos. I printed it up in black and white and then would color in each one and give them away for free. Sophie: Sarah and I have just spent the summer in LA where we worked on our England themed issue so we decided that when we returned to London we would base the next issue on all things America. As well as recipes and food related articles, we usually pick the things that we find most interesting about the theme; the people it encompasses, the tales and stories it evokes, the music or the writers and artists who relate to it. This issue has some of our most exciting recipes like Sarah’s Bacon and Bourbon Ice Cream and our Martini and Mint Juleps recipes. It’s the perfect read to get you drunk and hopped up on sugar. We also made illustrated top trump cards of some of the people we met while we were there to go along with the issue. Sophie: For me, its the illustrated musicians recipe book, which we’re working on right now, to go along with the February Music issue. 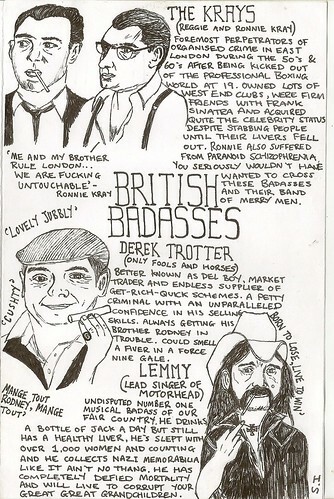 We’re currently collecting recipe from all our favorite musicians and then getting lots of artists to illustrate them. We’ve set up a kickstarter to fund it and it’s great doing something which you can involve loads of other people in, especially when it’s some of your favorite ever people! I’ve been constantly excited throughout the whole process. Sarah: It’s the recipe booklet for me too. We’re learning as we go along with the zine and with each issue I feel like we get better and better and I get more excited. My love and excitement for the zine grows exponentially so with each issue, I love it more than the last one and feel like it’s the best thing ever! Sarah: Waitrose magazine. It’s an in-store magazine for a British supermarket. It used to be called Waitrose Food Illustrated and had beautiful watercolor illustrations in it accompanying food articles. I figured that as soon as I decided I was ready to settle down and commit to living in one place and get a steady job, it would be with them. It was my dream job to write or work for them in any capacity. They got rid of the illustrations and the articles got more boring and I realized that it was aimed at an older, more middle class audience and I could create a magazine I really wanted to work for. That’s how Gutfeelings was born. Sophie: I kinda jumped on Sarah’s coattails with this. We’d both just got back from California on separate visits and felt like we needed a creative project to throw ourselves into. I’d say my biggest influence was the unappealing prospect of being back in the rain and wanting something to be excited about! We also liked the idea of building a little creative community of artists and writers. Sarah: Tumblr is kind of a constant influence too. We come across so many illustrators on there whose work is amazing and who we want to collaborate with. Its such a great platform for sharing and discovering arts. Sophie: When we’re not in our respective places writing or drawing for the zines, we’re usually writing or drawing about, or for, other things. We spend a whole lot of time talking emphatically to each other about a million different ideas, making plans and lists, having our heads in the clouds or getting into situations that we can write about. It keeps us rolling. Sarah: Getting into trouble with boys. I’ve always found this kind of helpful to me creatively. When I have a crush or am infatuated with someone I am seeing I get inspired and want to make stuff for them and then when I get rejected or the second my heart gets even slightly bruised or burnt, I am even more inspired and more likely to stay up until 6am writing or drawing or coming up with new ideas. Sophie: That’s not an invitation to break our hearts though please. For more from Gutfeelings, check out their website!